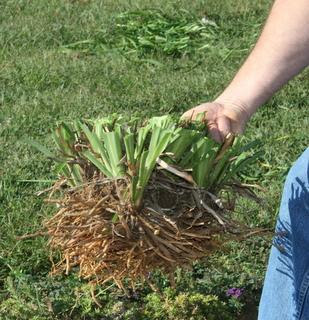 You can divide any daylily clump that has two fans (divisions) or more, but typically you would want to divide clumps that are several years old with quite a few fans. until you can pop it out of the ground. Shake off some of the dirt so you can see where to divide the plants. 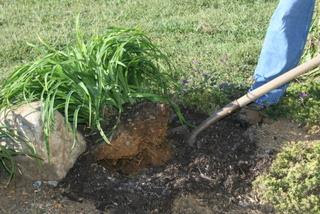 You may also want to trim the foliage (6-8″) so the plants are easier to handle. 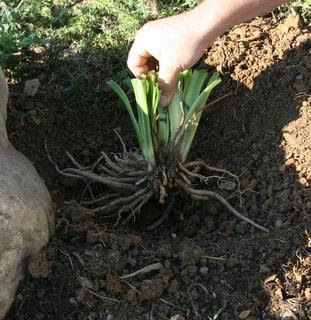 Trimming is optional, but if you don’t trim, the leftover foliage may wilt and look ragged after transplant. New foliage will typically start growing back soon after transplant, especially if you keep them well watered. 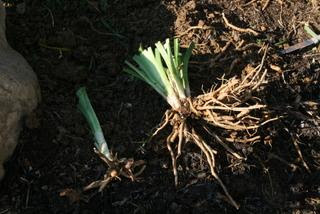 Often you will just be able to pull the plants apart (some varieties divide more easily than others). 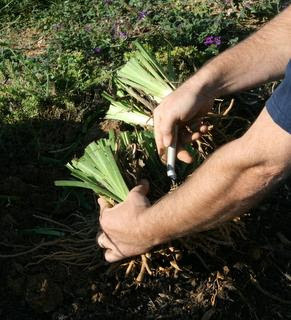 If they don’t pull apart easily, you can use a knife to pry or cut the plants apart. 5) How small to divide? You can divide as small as one plant, like the plant on the left in the picture, but you will probably want to leave a few plants together like the plant on the right. If you divide to a single plant, you probably won’t get much bloom the next year. Dig a hole deep and wide enough to place the roots. Plant to the depth they were previously planted. The white ring between roots and leaves is about ground level. Cover the roots and firm the soil. 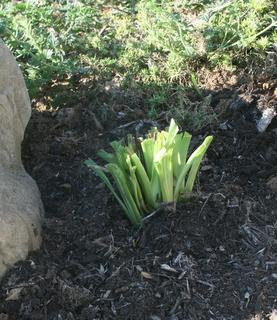 We usually toss a slight handful of basic fertilizer around the drip line of our daylilies in the fall. We just use a basic balanced mix that we get from our local Farmer’s Co-op. 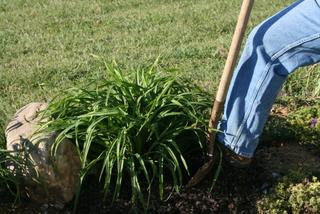 After you fertilize, don’t forget to water and mulch your new daylily. Then, just sit back and let that beauty grow!